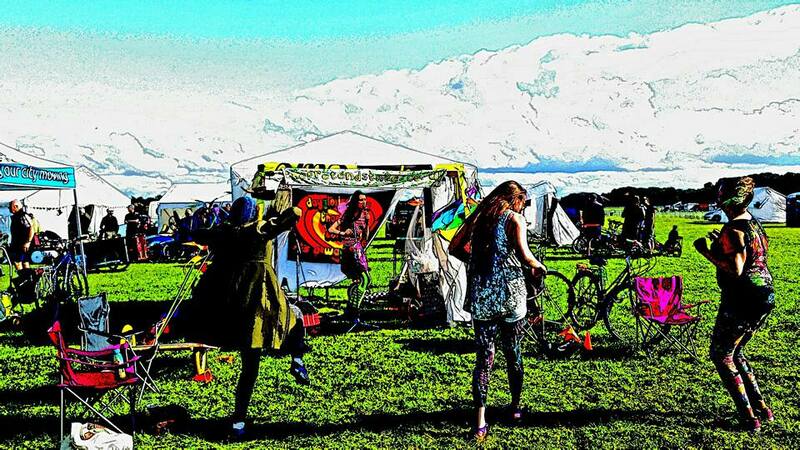 Everything is neatly packed away and recharged after The Pretend Stage went to York Cycle Rally for the first time. Midsummer is a busy time for us so we had to make a choice between venues for our party and I am happy to say we made the right one, the rally was great fun with crazy home made inventions all around and people hell bent on getting everything they can out of the world around them. We managed to attract a crowd in the rain and then coax the sun out from behind the clouds with a properly bizarre show. York rally marks the first event where the content of The Pretend Stage has been 100% live performed by the original artists. It sounded amazing. Thanks to Bingersuk for being our token lad and bringing very traditional and lovely and at the same time absolutely contemporary songwriting and performance, Hexagon Chic for bringing something unique, fascinating and devastatingly fresh (and covered with melted cheese) and Yo! Violation for tearing the heart out of an aerobics instructor from Miami and holding it aloft for all to witness. Our act for the day ‘The Crab Apples’ went down a treat too! Even more thanks to everyone from York Rally 2015 especially those who came up to talk to us as we packed down the stage. We fitted 4 acts into 3 hours somehow so we were about as busy as we could be and didn’t have that much time to look around and chat so it was wonderful to receive not only gratitude for our effort and encouragement for our future but also tales of cycling adventure and great travelling achievements. I thought I was tough for riding from Birmingham to Bristol and the lady stood next to me had been from Bradford to Croatia! York Cycle Rally is the bomb, check it out or miss out again next year!